This air wipe is designed for the removal of water and other low viscosity liquids from extrusions up to 8mm diameter at line speeds of up to 1000 meters/min. The 5-stage compound design of the Marldon high speed air wipe is adjustable to provide physical contact or minimal clearance from the extrusion which effectively removes a large proportion of liquid by breaking the surface tension, enabling the five pairs of air jets to wipe more efficiently using a lesser volume of air. 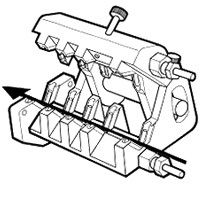 The air wipe body is in two halves, hinged together in a unique way to allow adjustment for different cable diameters. It can be opened for string-up of the line and is self-opening in the event of knots or lumps in the cable. The unit is spring loaded to effect closure after the passage of lumps and to hold the upper half in place against its tendency to lift with the air cushion. Wear-resistant ceramic pads are incorporated to steady extrusion within the airwipe. Air consumption is approximately 15cubic feet/min. at 80 psi. (.42 meters/min at 5.6Kg/cubic meter).